A cluster of poppies and cornflower growing in my mother’s veggie patch. These sorts of flowers make great companion flowering plants. My mother still lives on the family farm at Mickleham. She’s has an extensive and productive veggie patch in the backyard. It’s also the location of our giant edible trellis project. Back in autumn, mum came across some “out of date” packets of flower seeds she had stashed away. 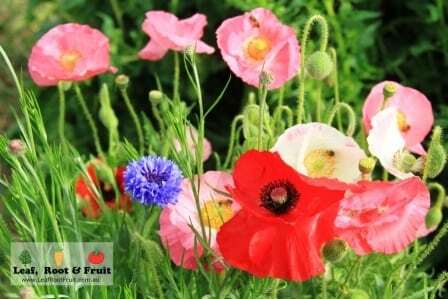 The seeds included poppies, corn flowers, alyssum, and also a cottage mix. Rather than just throwing them away, mum scattered the seeds in a few spots throughout the veggie patch. The poppies germinated especially well and have really taken off, with the recent spring weather, we are now enjoying. When I visited mum on the weekend, I was stunned at the gorgeous display the poppies made, as now they are flowering. What was equally incredible was the number of bees that they attracted. At any given moment, each poppy flower had three to four bees buzzing around it and clambering to get in. They were after the nectar in the middle of the bloom. In the process they were getting covered in pollen and moving it on to the next flower that they visited. Here are some photos that I took on the day. Not only do these companion flowering plants look great, but they’ll help ensure all your veggies are well pollinated. Increased pollination means better crop yields and better quality produce. For example, deformed strawberries are usually a result of poor pollination. What sorts of companion flowering plants do you use around the veggie garden to attract pollinators?